Sometime a little before 4:00 today, the young cowbird fledged from the Eastern Phoebe nest. 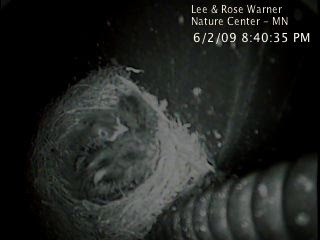 Now there are just three little phoebes resting in the nest. Paul watched the live feed around 4:15 and the adult phoebe was still feeding the baby phoebes. Hopefully they will get a chance to grow faster now. It will be interesting to see if having a food hogging cowbird in the nest will affect fledge time for the phoebes. Were the parents able to keep up the caloric needs of the three phoebes and the cowbird? They should fledge around June 7th but I don't really see that happening. Cornell is listing the hatch date as May 22 but I wonder if that was the day the cowbird hatched. I don't think the phoebes hatched the same day. No sign of the second cowbird egg. There were two. Either it is still in there under all those birds or it was kicked out as well.